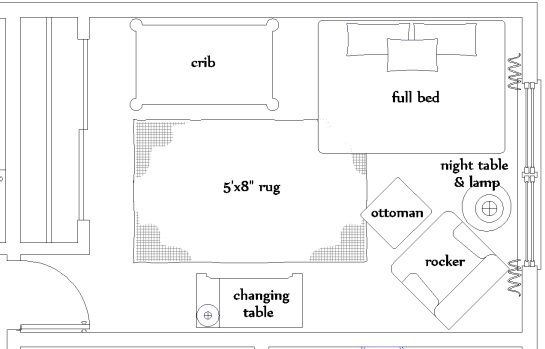 Being the indecisive person I’m I had a hard time deciding the floor layout for the nursery. I tried many options, with the crib caddy corner, the full bed centered by the window, the crib centered and many more. This room is the smallest in the house but it’s all baby G will need. Even though it is a small space I still decided to place a full bed in there for two reasons. The first months baby G will sleep in our room in a bassinet so his room can be used as a temporary guest bedroom. And since my family is coming the first days of June it made complete sense. After that, I think having the bed there will be very helpful with midnight feedings or just to hang out and chill out with the baby. So I had to place a full bed, the crib of course, a changing table, a rocker + ottoman and a night table. Besides other accessories like the hamper, diaper pail, toys, etc. I read it’s not recommended to place the crib by the window so that helped me made up my mind. After asking for the mister’s feedback we decided on this layout. I think it works. There is plenty of space to move around and there is enough space in the center of the room for baby G to play when he is a little older. A rectangular rug will tie the room together. I'm very excited about how the nursery is coming along. I promise I'll be sharing soon! Tomorrow is my virtual Baby Shower. Can't wait! Looks great!!! and that bed seems very comfy for the aunt ;). See u at the vbs! I know I'm late - Congratulations but the way!!! How big is the nursery? I'm definitely looking to fit a bed with the crib so grandma can stay close, but not sure if I have room.